Saint-Romuald (population ca. 11,700) lies on the south bank of the Saint Lawrence River, opposite Quebec City and not far from the two bridges “Pont de Québec” and “Pont Pierre-Laporte”. Saint-Romuald has been one of Lévis’ 10 boroughs since 2002. The village has existed since the mid-19th century, and used to be called “Saint-Romuald d’Etchemin”. At the beginning of the 19th century, workers in the lumber industry started to settle there with their families. 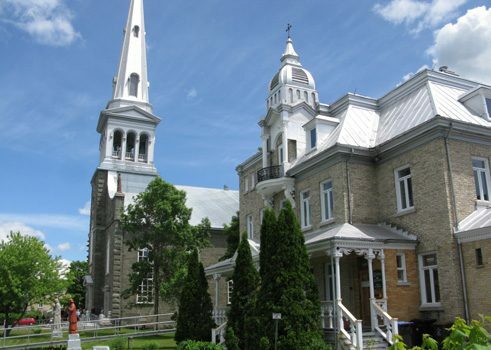 In 1852, the residents of this settlement called upon the Archbishop of Quebec in order to ask him to allow them to establish their own church. They were granted permission, and in 1854, Pierre-Téléphore Sax became the first vicar (or curé) of the new congregation. He was bilingual, and therefore the ideal priest for this particular Catholic congregation, which was made up of worshipers of both French and Irish descent. The church was built between 1855 and 1856, and it was based on plans by the architect Charles Baillargé. The work was performed by stonemasons Joseph and Louis Larose, carpenters Paul and Joseph Breton, and the joiner Édouard Gaboury. In 1901, the old vestry was replaced by a new one designed by architect David Ouellet. But what does this church on the south bank of the Saint Lawrence have to do with Germany? After taking on the job, the minister Sax visited the Benedictine monks in New York state, most likely in the 1860s. The monks recommended a few artists to him: the painters Wilhelm Lamprecht and Josef Lang, both from Bavaria, as well as painter Wenceslaus Thien, who was of German origin. These artists, who normally worked in the US, painted the elaborate interior decorations of the Saint-Romuald church from 1867 to 1868. 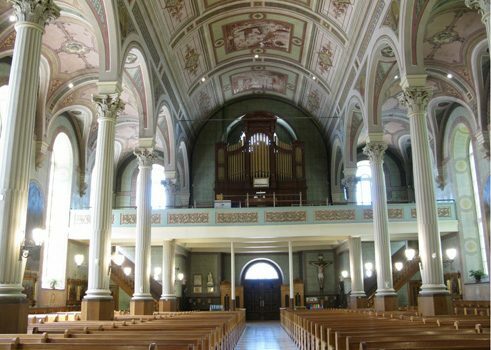 At the time, murals were not well-known in Canada because of the harsh climate.The Munich native Wilhelm Lamprecht was responsible for the paintings along the walls of the side aisles and in the choir, as well as the high altar painting. He also oversaw the whole project. 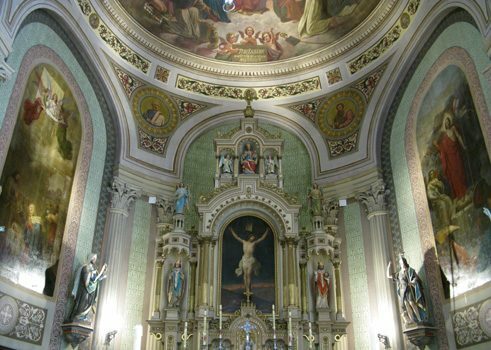 His former classmate Josef Lang painted the large mural in the vaulting of the apse and scenes from the life of Saint Romuald. The altars, which were designed by Munich sculptor Georg Schneider, were manufactured at the local “École de Sculpture”, and the polychrome figures of the saints were directly imported from the atelier of a Munich sculptor named Johann Evangelist Riedmiller. The well-preserved religious murals in the interior of this church in Saint-Romuald - a rarity today in North America - are thanks to both the first priest of this small congregation, Pierre-Téléphore Sax, and the Bavarian artists. The church has been classified as a historical monument since 2004.